For Fathers Day, let your Dad and Dads know how special they are in your life with these delicious sliders made with some heavenly scented lemongrass-marinated pork. They are so yummy, I’m going to treat myself to these bad boys on Father’s day. Thanks to the kind folks at Snake River Farms, I used their Kurobuta pork collar but you can easily substitute pork shoulder instead.These sliders are a bit spicy, tangy, sweet, and have a refreshing herbal brightness due to the lemongrass and ginger. 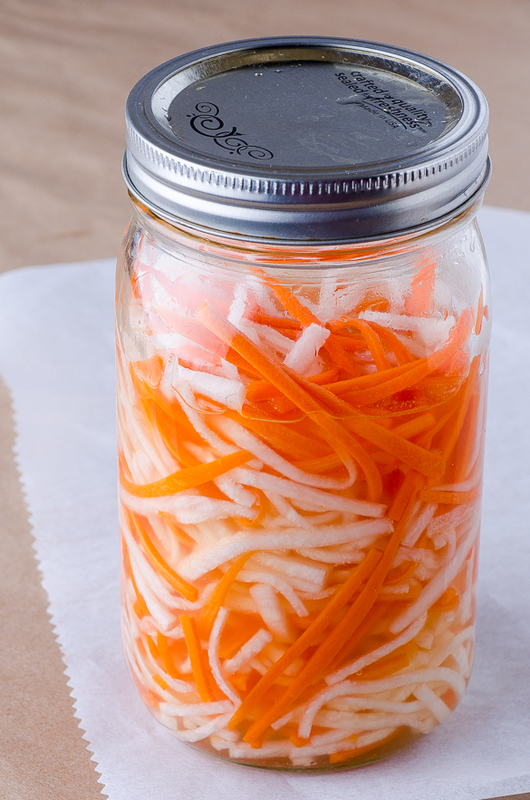 The daikon carrot slaw completes the picture with a satisfying acidic bookend to the flavors. 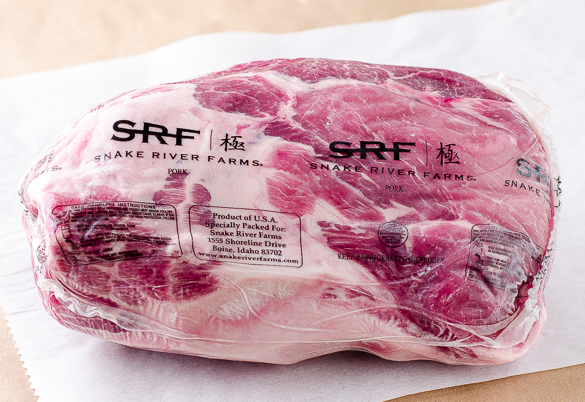 When Snake River Farms approached me to create a special Father’s day dish with their pork collars, I didn’t tell them that I did not know what pork collars were. Sure, I’ve cooked many parts of the hog but I’ve only vaguely heard about the collar and had never seen one. SRF told me that their Kurobuta pork collar was a remarkably versatile cut that looks like an enlarged pork tenderloin except it has both fat and meat in it. My Internet research revealed that this cut is popular in Europe and it’s shoulder meat that runs from the base of the pig’s neck to the tip of the loin. I love Italian food and apparently I had already eaten pork collar because I enjoy a salumi called Capicola or coppa for short. The coppa is made from the collar. Also, I’ve cooked dishes using another Italian salumi called Lardo which is the layer of fat on the top of the collar. So even though I’ve never seen one, I’ve eaten pork collars a few times. As a pitmaster, I’ve enjoyed life’s highest pleasures by eating my share of pork breeds such as Berkshire, Chester, Yorkshire, Kurobuta, Red Wattle, and Duroc. The Kurobuta is descendent from the famous Berkshire hog from England which was bred for Kings due to the exquisite marbling and deep sweet pork flavor. 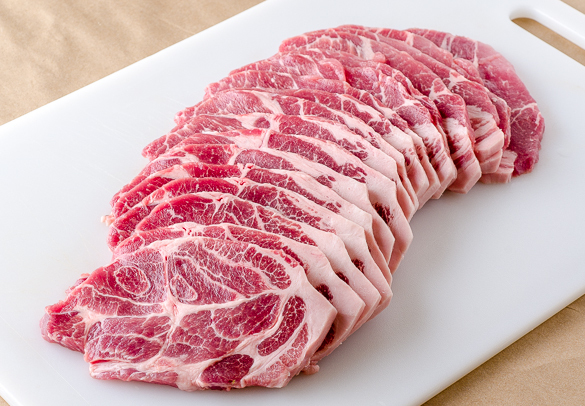 This pork collar meat is very marbled and tender and is superbly suited for grilling. There is much less connective tissue compared to the pork shoulder so it does not have to be cooked low and slow for 8 hours to make it tender. 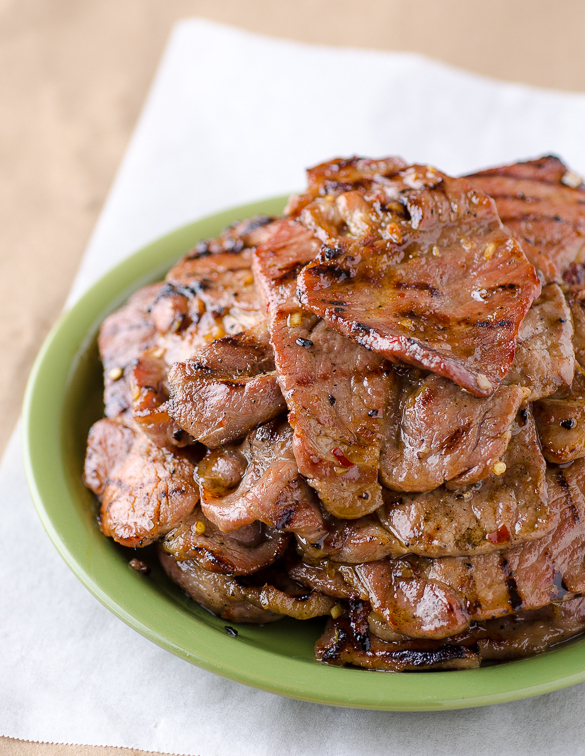 A quick grill and char is all that’s needed to bring out the sweet pork flavor. 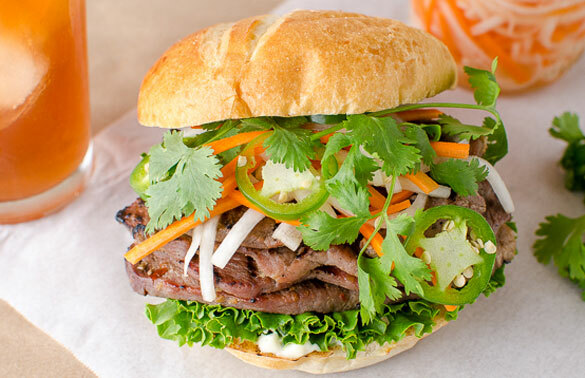 The inspiration for this style of grilled pork sliders comes from the thriving Vietnamese community in Los Angeles and Orange County where I often stop to enjoy a baguette sandwich with grilled pork, mayo spread, lettuce, jalapeno slices, and carrot/daikon slaw. I prefer my grilled pork on a soft hamburger bun slider-style so that ‘s what I used. I also like to squirt some Sriracha as I like my pork sliders spicy. Freeze the pork for 2 hours to firm it up for slicing. 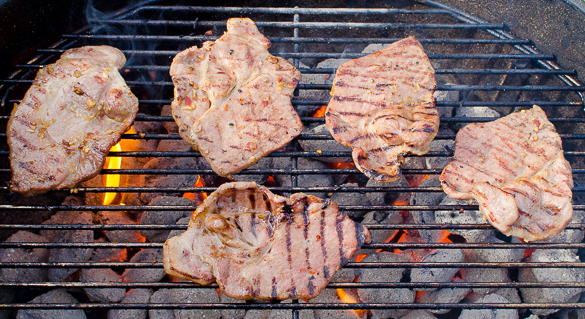 Slice pork collar into ⅛th inch medallions. Note, If you’re not using a marbled or tender cut like Kurobuta, you can pound the pork slice between two sheets of plastic wrap to make it more thin and tender. 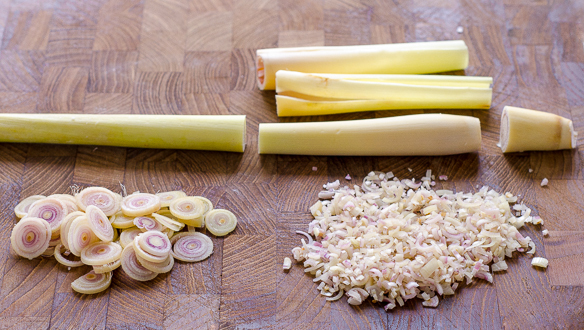 Prepare marinade. It resembles a thick syrupy slurry. Dredge pork slices in slurry and stack the dredged steaks in a pan. Cover and refrigerate. While pork is marinating in the slurry marinade, prepare the carrot/diakon slaw. 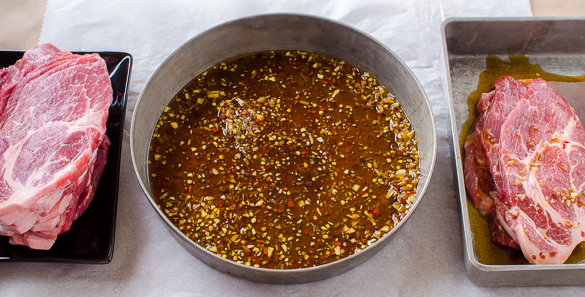 Mix the vinegar, sugar, fish sauce, and water in a bowl. 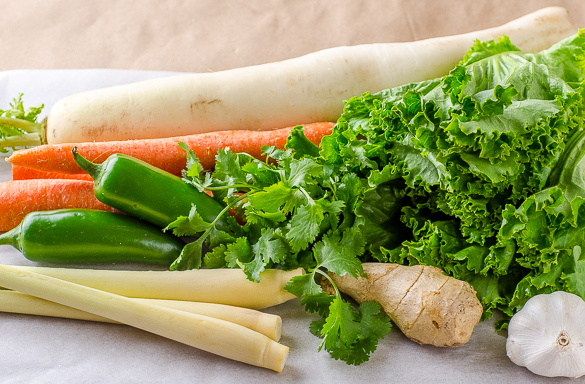 Add julienned daikon and carrots. Mix and taste to adjust seasoning. Let stand in fridge as you marinate the pork slices. They can be refrigerated for several days. Preheat gas or charcoal grill to 450F or hotter (I prefer charcoal if I have time). Remove the pork slices and shake away excess marinade. Discard the marinade. If you’re using an oven, use the broiler and cook around 6 minutes, flipping once until cooked and nicely seared. 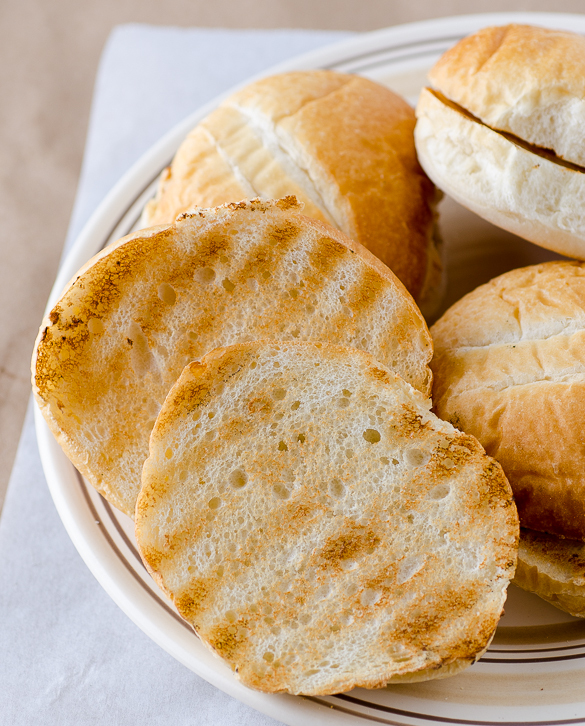 Lightly toast your hamburger buns. 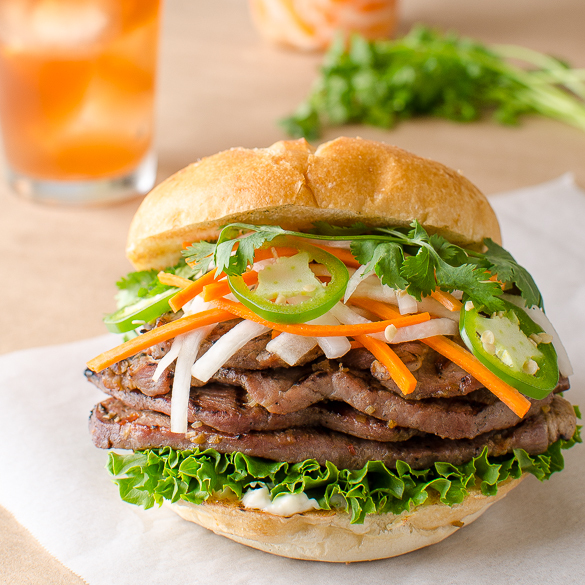 Assemble the slider by starting with a mayo spread on both sides of the bun, add lettuce on the bottom half of the bun, then add the grilled pork slices (I like two per slider), and top with jalapeno slices, daikon/carrot slaw, and some cilantro. If you don’t like cilantro, skip it and I won’t tell. Squirt some Sriracha if you like your sliders spicy. Enjoy with an Arnold Palmer ice-tea lemonade. I cannot wait to make this! I love Saigon sandwiches! This looks to die for!! I made this yesterday for a July 4th party. Thanks Harry..this was just excellent!